Yesterday, Apple posted solid financial results for fiscal Q2, mainly on the back of better than expected iPhone sales in China and Japan. 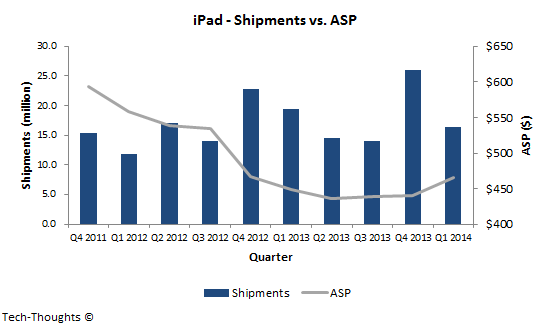 However, a lot of discussion seems to be revolving around the sudden slowdown in iPad sales. I think explaining this decline requires a small addition to my previous analyses on usage based segmentation and the structure of the tablet market. One key point I may have missed in my previous analyses is the interplay between the smartphone and tablet markets. Most industry observers dismiss the impact of "phablets" because they are a "niche in emerging markets". This view is problematic, mainly because the definition of phablets is too restrictive -- Is a 4.95" smartphone any less of a phablet than a 5.3" smartphone? Getting caught up in semantics distracts us from the real pattern here -- large screen smartphones seem to be cannibalizing computing time from tablets. When I compared my usage based segments of the smartphone and tablet markets, I noticed a major overlap between smartphones used as pocketable computers and tablets used for media consumption. In effect, the need for today's tablets seems to be stronger among low-end (non-computing) smartphone users. This explains strong demand for low-priced Android tablets in emerging markets and their usage patterns (primarily video and media consumption). The iPad is priced out of the market segment that still finds media tablets "necessary"